A Third-Party Accessory Brings Mobile Payments to Three Pebble Devices. 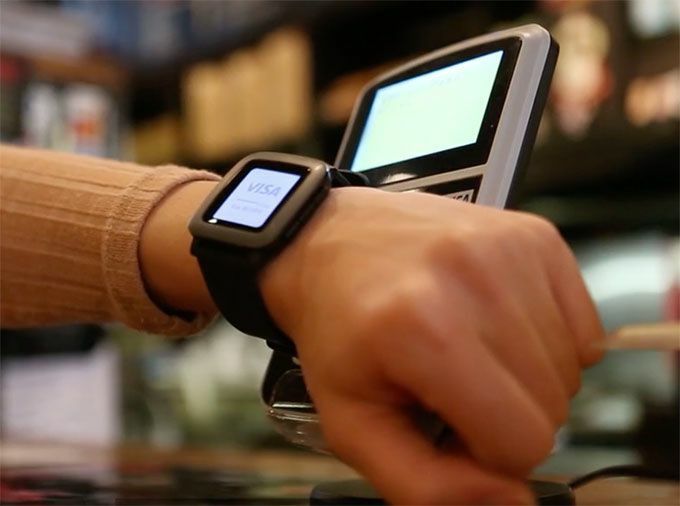 Mobile payments are becoming a big deal, not only on smartphones but on smartwatches as well. The ability to complete a purchase just by tapping or scanning your device — without the hassle of pulling out your wallet for cash or a credit card — is definitely appealing, but not all gadgets and retailers are fully up and running with this technology yet. However, if you're a Pebble smartwatch owner — with any of the more recent models in the Pebble Time lineup, from the Pebble Time to the Pebble Time Round — a new accessory can make mobile payments a reality for you. The Pagaré (that's Spanish for "I will pay," for the record) NFC Payment Smartstrap is currently up for funding on Kickstarter, where it seems poised to meet its $120,000 funding goal. If the project succeeds, it will let Pebble wears pay with their watches at a wide variety of merchants, including Bloomingdales, McDonald's, Toys R Us and Subway among many others. Read on for a look at this specific product, along with some information about mobile payments on wearables in general. Pebble, which notably also started out on the crowd-funding website Kickstarter, was one of the first companies to popularize the smartwatch in its most modern form. It currently sells five different models, including the Pebble Classic, though this optional Pagaré accessory apparently is only compatible with the Pebble Time, Pebble Time Steel and the Pebble Time Round. Utilizing NFC (Near Field Communications) technology, the band has a chip that is registered for processing payments when you hold your watch near a card reader. Of course, you'll have to connect your credit cards to the system ahead of time, but luckily it works independently of your phone, so you won't need to turn to a phone app or ensure your smartwatch is paired over Bluetooth with your handset for a transaction to work. As for the design, in line with the general Pebble aesthetic, this band looks modern, if not particularly sleek or high-end. According to the Kickstarter page, the Pagaré can be swapped for another Pebble strap within 10 seconds, so it sounds like the ease of use shouldn't be a problem. Pledging at least $49 guarantees you a Smartband when it becomes available and if the project is successfully funded, so it's likely the product will cost at least that much if it becomes commercially available down the line. If you don't have a Pebble device but are interested in both wearables and mobile payments, you may be wondering what your other options are. This third-party "Smartstrap" isn't the only way to pay with your smartwatch — notably, the Apple Watch includes mobile payments courtesy of Apple Pay. To use Apple Pay on your Apple Watch, you must first link your cards. After that, you simply double-click the watch's side button and hold the watch up to the contactless payment reader. You'll receive a tap and a beep as confirmation that your payment was processed. Things are moving a bit slower on the Wear OS (formerly Android Wear) front. While Google does offer Android Pay for mobile payments, wearable devices running its Wear OS software are not yet compatible with this. Since this is a clear way that Apple Watch is ahead of the curve, it's likely that Wear OS will catch up soon, though.